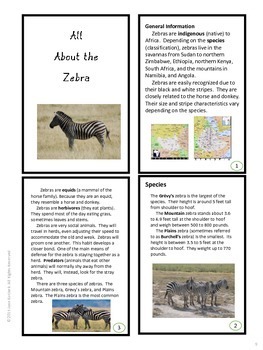 This is a 33-page Lap Book/Center Activity for The Zebra. 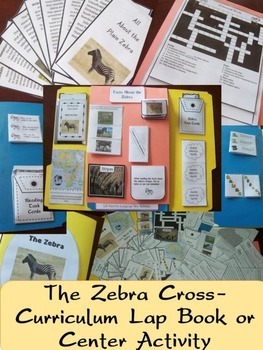 This is a cross-curriculum lab book/ center activity. It is a great way to get students interested in Science and Social Studies. This is the second animal in my Africa series. The countries introduced include: Sudan, Zimbabwe, Ethiopia, Kenya, South Africa, Namibia, and Angola. I will be offering more lap books that will center on the specific countries of Africa. Are your students getting a little tired of only doing task cards for practice? 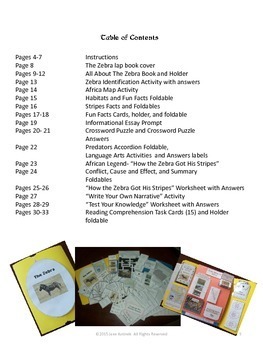 These lap books are a creative way to re-invigorate your students. They include tonsof fun, interactive activities that build background knowledge and increase academic vocabulary. 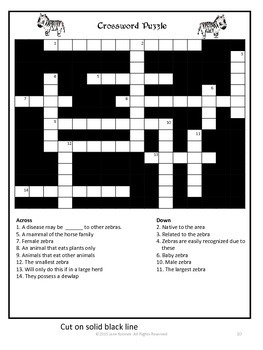 Answer keys are included for the crossword puzzle, Plot Worksheet, Zebra Identification Activity, Reading Task Cards, and Test Your Knowledge Worksheet. The Raft by S.A. Bodeen A Novel Study.